Back in June, our family had two very special milestones to celebrate….my mother-in-law’s retirement and my mom’s 60th birthday. This may not be wedding related…but it is still blog worthy!! We decided to throw a surprise party for each of these two special ladies….but have them on the same night. Complicated? YES! An amazing night to remember? ABSOLUTELY! We started in the Cellar at HOTEL VINTAGE PLAZA with a fab Italian dinner for Shelby (my darling mother-in-law). She was a teacher for 35+ years and is definitely ready to live it up with some time off. Shelby is a scrabble connoisseur, so we used scrabble pieces on her invitation, and bought scrabble boards to serve as a base of the table arrangements. We even spelled out teacher words on the different boards! We invited about 50 of Shelby’s friends and family to join us for dinner and some hilarious toasts. The best part of this double surprise was that we told each mom that they would be going to the other person’s surprise party…so they both kept quiet! Shelby was so surprised when she first walked into the room, that she started to turn around to leave–it was priceless! 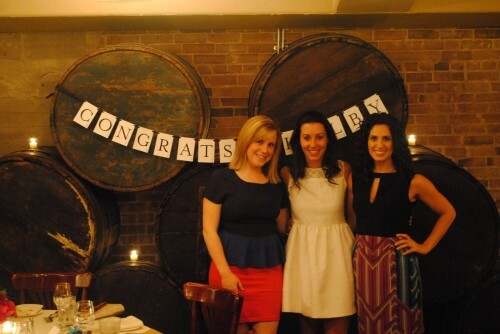 The toasts all had one common sentiment–Shelby is an amazing teacher, and a wonderful person with a heart of gold. During dinner, my mom’s friends and family (that weren’t already with us at dinner) started arriving on the 2nd floor in the Tuscany Room at Hotel Vintage Plaza. They were greeted with a big dessert buffet, several old photos, and great music by CHAD DOWLING PRODUCTIONS. We snuck my mom out ofthe dinner for a while (the excuse was to take this family photo!! ), and informed everyone what was going on. On a cue, guests knew that they would be heading upstairs for “dessert and dancing.” My mom had no idea there would be another 50 people upstairs ready to surprise her! My job was to distract her for 15ish minutes until everyone from the first party could get upstairs…no easy feat! Well, we surprised her!! I’m pretty sure you don’t get cuter than this–I love this lady! This second phase of the party included more toasts, some drinking and LOTS of dancing. My co-conspirators, Court and Elizabeth! My dancing photos may not be too appropriate for this blog…so here is one of my favorite images of the Sheils clan at the end of the night. It was certainly an event to remember, and we had the best time treating these two VERY deserving ladies.